Many doctors are on the fence about whether using social media is beneficial to their practice. A number of physicians are concerned that patients may attempt to contact them through social media sites, which can encroach on ‘off duty’ time when arrangements for on call colleagues to cover patient matters have already been put in place. Also, patients sending information about symptoms could violate HIPPA laws or leave important symptoms unaddressed if you do not see the message, potentially causing major medical legal headaches or bad outcomes. Nevertheless, there are a number of useful roles for social media in a physicians’ life. Several social media sites are closed communities that allow medical professionals to connect with each other, to access medical news and practice updates, to participate in financially compensated surveys, and post comments or links. Some of the popular sites include Sermo, QuantiaMD, and Doximity. These are private sites that verify that users are, in fact, licensed physicians or healthcare professionals. In general, the public cannot easily access your information, posts or comments on these private medical sites, so you may feel a degree of freedom when making comments on such sites. However, many of your colleagues can easily sign in and search for you if you use your own name or last name on your profile. Therefore, it makes sense to post only the types of comments that you would be willing to share openly with any other health care professional in person. Since these private medical sites are closed, it is highly unlikely that your patients, friends or relatives could gain access your posts or remarks. Yet, as we have all learned, even high-ranking government officials have had their online activity exposed (true, hackers have more to gain by breaking into the accounts of important public figures.) So, it is, of course, possible that your password could be hacked and your account unlawfully broken into. An even stranger, but highly unlikely event could occur if someone who has legitimate access to the site were to take a screen shot of something you post, making it accessible to eyes that do not have permission to use the closed site, even if you delete your activity. Facebook is among the most well-established and well-managed social media sites. Facebook has various privacy settings, which allow you to control who you connect with and who can see your profile. Facebook users can create a personal profile page as well as a professional page. A number of physicians who use Facebook non-professionally employ techniques to protect privacy. Doctors who use Facebook socially, and want to be ‘unsearchable’ can make profiles with strong privacy restriction or can use only the first name and last initial, or a nickname or middle name to connect with friends. Professional Facebook pages can be a nice way for physicians to post health tips or interesting news for patients. A professional Facebook page can serve as a marketing tool. When people 'like' or 'share' your page or posts, they can effortlessly spread the word about your practice. You can build a professional page that is moderated or that does not allow anyone to post on your wall to avoid random posts or even online trolls, which diminish the page’s professionalism. LinkedIn is a professional networking site. LinkedIn allows you to build a professional profile, connect with colleagues, find job listings, or find candidates for a job opening. LinkedIn is an effective networking tool and can be a good way to contact job recruiters. LinkedIn allows users to 'endorse' each other for professional skills, which promotes positive associations between users. And, LinkedIn does respond appropriately if an unknown or bothersome user contacts a member. Twitter allows users to build simple profiles and post short 'tweets' that are a maximum of 140 characters. Tweets can be linked to an image, a GIF, or an online webpage or article URL. Physicians can use twitter to post helpful health tips for followers, who may or may not be patients or colleagues. 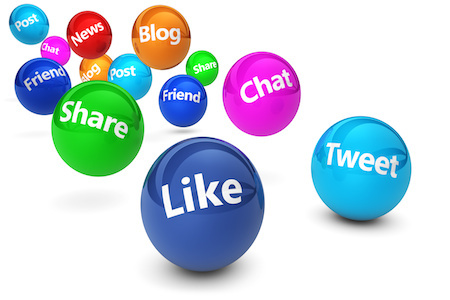 Twitter can serve as a marketing tool for your practice. In general, more twitter followers means more visibility for your tweets. And, if your tweet is ‘retweeted’ by a user who has many followers, then your tweet may be widely viewed. Twitter users who have many twitter followers are generally famous celebrities, although a non-celebrity can have a large number of twitter followers. Ways to build a twitter following include tweeting very interesting tweets, using colorful images and GIFs, and engaging your followers by ‘retweeting’ or liking their interesting tweets. Instagram is a popular social media site focused on the use of images uploaded from your phone. Physicians who would want to build a profile based on images might find Instagram useful, as it is one of the most popular modes of social media today. Snapchat is a messaging app primarily used for sending images that characteristically 'disappear' within a short amount of time. It is possible that some creative physicians could develop a useful way to adapt Snapchat for professional use, but for now it is primarily a very popular social tool. Given that the principal feature of this app is about the lack of longevity of the images, this could potentially allow physicians to ‘see’ patients without as much risk of breaking HIPPA laws as there would be with other social media. Pinterest is a site that people use to save ‘pin’ images and information on ‘boards’ that are often created around a common theme. There is significant interest in wellness, exercise, disease prevention and recipes on Pinterest. So physicians who want to use this platform to promote wellness may be able to optimize the site. Flipboard is a popular news sharing space. You can use it to follow topics in a niche interest and you can also share articles on topics of interest, creating your own ‘board,’ which is someone like a curated news channel of your own. Scoop it is a content curator, which means that it is a source of news 'scoops’. You can follow topics and you can suggest news for other topic curators or you can create your own topic and post news that you consider relevant and interesting. If you build a large following, you can share your curated news articles with a wide audience. Social media can play a number of different roles for physicians. You can use it to socialize with friends, to network, to connect with other doctors, to market your practice, to share health and wellness tips or to find and share interesting medical news.